The Flowering Pear trees (Pyrus calleryana) are blooming all over the city, especially in newer neighborhoods like mine. What's not to love about a tree that has such beautiful white flowers in the early spring. Really, they bloom before the lilacs around here! Everyone plants them, and in some neighborhoods, the developers even require that every homeowner plant them along the curb. Truly, it is a beautiful sight to see a row of flowering pear trees blooming in the spring. They can take your breath away. They can take your breath away because the flowers don't smell good. Have you ever smelled the flowers? How would you describe that smell? It's not exactly a stench, but it sure isn't a fragrance. It is more like a smell. It's almost like the smell of something odd burning, but not quite that. In some ways, the flowers smell like maybe you stepped in something that you wished you hadn't stepped in. But that's not quite right either. Maybe it is more like someone is grilling out some kind of mystery meat? Yes, that's what it smells like to me. Grilling mystery meat. Admittedly, it's not likely that the smell will make you physically sick, but it definitely isn't a pleasant floral smell. It makes me wonder what kind of insects the tree is trying to attract to pollinate it. Besides the smell, there are some other things that people should know before they plant flowering pear trees in their gardens. First, varieties can vary quite a bit, so plant a named variety, and make sure it is a good one. Different varieties have different shapes. 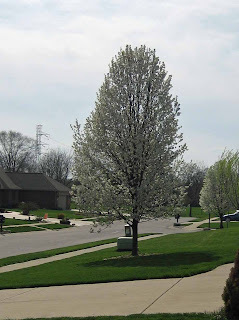 My neighbor on one side has a flowering pear tree with a rounded shape. I don't know if you can tell in the picture, but they have also tried to stake it because it leans to one side. I notice a lot of the flowering pear trees leaning, so that must also be a fairly common problem with them. My neighbor on the other side has a flowering pear with a nice cylinder shape. This particular one is 'Cleveland'. I helped the neighbor buy it, that's how I know. I think it is a good variety. Second, know before you plant that these trees are fast growers and so are generally weak wooded and likely to lose a limb or split in two if a big storm hits them the wrong way. Third, don't expect a flowering pear tree to last more than 25 years or so. It is not a tree that ages gracefully. I think most reputable nurseries will tell you this. If you plant one, just plan for its eventual replacement if you plan to stay with your current garden for that long. But even knowing all this about the flowering pear trees, you still might want to plant one or two of them because they are beautiful blooming trees in the spring. 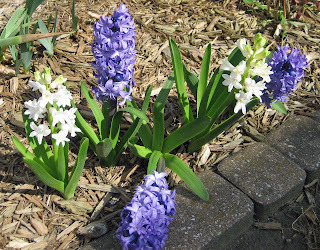 But also plant some hyacinths nearby. Why? Because you'll want to go take a big whiff of hyacinth blooms after you've smelled the flowering pear tree blooms, just to clear your nose and replace that bad smell with a good smell. We don't have any flowering pear trees, so I had no idea they smelled so badly! Locally, arborists are recommending against planting too many Bradford pears for the reasons you stated. I think too many people planted them without knowing their susceptibility to storms and the limited life expectancy. As for me, I keep watching my flowering crabapples and the redbud, hoping they will bloom soon. European Mountain Ashes are also lovely short-lived trees, Carol, but two days after the flowers opened they smelled like a duffle bag full of college laundry brought home to mom. I've seen flowering pears not just lose limbs but split in half... they probably shouldn't be planted too close to a house. 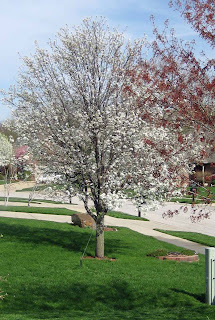 Our Bradford pear is a city tree...meaning the city will plant a tree in each yard if you request it...since we had no tree after our remodel 16 or so years ago that's what we got. They no longer plant Bradfords because of the weak limb problem. the first time I really smelled that smell I had just come home from washing my car at the do it yourself carwash...I thought it was a yucky water smell and kept re-rinsing my car to get it off...I finally figured it out! Your talk about these ornamental pears smelling awful reminds me of what I think about boxwood. The glorious boxwood that so many gardeners don't feel like their garden is complete without a group of them. Well, I think they smell horrid. We have boxwood by our front door and for the longest time I thought a cat was marking its territory by our front door. Then a new friend of ours came in the front door just so thrilled that she smelled the wonderful boxwood odor of her southern home she had to leave behind. I about croaked thinking that all this time I have been blaming the neighborhood cats and trying to camaflage the odor with coffee grounds I collected from coffee drinking friends. I didn't know I had such a wonderful thing in the front garden. I fully agree that these trees are gorgeous during spring. It seems like there are fewer and fewer of them to see now. I think as they break apart and die they aren't being planted as much as they used to be. All this time though I have never smelled a pear tree. We have a flowering pear in our front yard, but I have never noticed the smell. It is planted far from the house, so maybe that's why I've never noticed it. Now, you have me curious, I'll have to remember to smell the flowers next spring. I have had the misfortune to smell these on numerous ocasions. The first time I smelled them, I stuck my big snoze in a bunch of blooms and sniffed. YucK! Our quaint downtown is lined with flowering pear trees, but I have to admit that I've only driven through the area and never stopped long enough to catch a sniff. You've motivated me to walk downtown and proverbially stop to smell the flowers. We have a 40-year old Bradford Pear in our front landscape. They don't age gracefully. We've had ours limbed up recently instead of taking it down and replacing it. While it will never regain it's youthful figure without paying an arborist to shape it every 2 years or so, limbing it up was a marked improvement to it's aging appearance. It's still lovely in bloom, has nice leaves, and good fall color. I'm glad they're being planted less these days. To me it doesn't make sense to plant a tree that will be hazardous and unattractive in maturity. When I plant a tree, I prefer one whose beauty and usefulness in the environment will outlive me. I hope to never have to cut down a tree I was responsible for planting. oh, you are right about the smell, but a group (dare I say row?) along the street is very nice when they are blooming. I never noticed the smell and I have two Cleveland pears. I will have to go outside and sniff. I also have boxwood, but I like the smell. 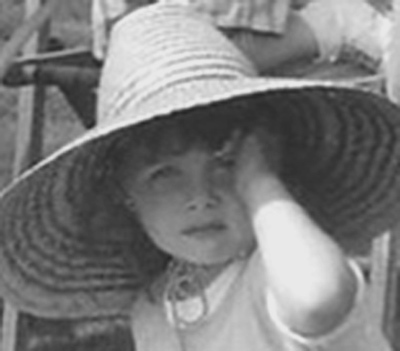 It reminds me of the trips we made to Williamsburg when the girls were younger. bad smell or not, I find it scary that you can be "required" to plant anything. Rose, I agree, there are better trees than flowering pears and people are learning that. I hope my redbud blooms this weekend. It is late! Annie in Austin, After reading your comment, I had to go right back out there and smell the hyacinth again. That's a vivid description of smell! Leslie, I think most people think of the flowering pear as an urban tree, it is certainly over planted in my city! Lisa at Greenbow, I know what you mean about that boxwood smell. My neighbor has some by her front door and it took her awhile to figure out they were the cause of the smell, not cats. Read my sister Kathy's comment further down. Jan, I assume your tree has already bloomed this year? Garden Fairie, I don't have groundhogs around here, so I'll take your word for it and be thankful that I don't. Dee/reddirtramblings, Funny thing is I don't remember seeing flowering pears until the 70's? Then it seemed like they were everywhere, and now people are realizing they have some "issues". Heather's Garden, After your walk, let us know what you think of the smell. Garden Girl, I think we would all like to have trees that never have to be cut down. Limbing one up and maybe underplanting with shade loving plants is a good idea. They do have good fall color. Muum, Sure, you can say "row of trees" because that's what they are, and they are pretty. Kathy, I guess smell is in the nose of the beholder, so to speak. I am interested to know if your flowering pear smells, too, because the one I smelled was also a 'Cleveland' variety. Sue Swift, Indeed some developers get carried away with the covenants of the neighborhood and make up some strange rules. Thanks all for joining in on the discussion about flowering pears! I just planted two pear trees in our backyard and come to find out the two mystery trees in our front yard are also pear! Goodness. They are quite beautiful, but I appreciate the tip about their weak branches (which we haven't experience any problems yet) and their longevity or lack there of. That will definitely help us choose more wisely for the rest of the trees in our yard. You know what else smell hideous? Boxwood. I carted home about 25 in my car a few years ago and I was nearly sick when I got home--stomach, headache. Double ugh. Goes to show you that all that is pretty isn't pretty smelling. The Flowering Pear trees are beautiful! Robin(Bumblebee), I know what you mean about the smell of boxwood. 25 in your car would make anyone sick. Marie, That they are and they are blooming everywhere right now. Carol, have you ever smelled a Washington Hawthorn in full bloom? OMG. I don't know if I can post here what it smells like. Okay, maybe I can state it tactfully. I'll try. The trashcan in a women's restroom, if you know what I mean. Yeah, THAT BAD. We must have been on the same page the other day! You are definitely right in not recommending those trees, too many bad features. 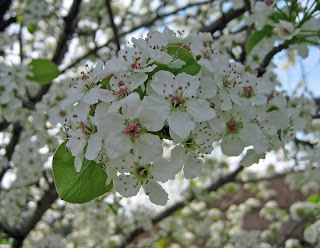 Hello, As a native of SE Indiana I've been surfing and looking and wondering about these wild trees that are blooming like mad at the moment and smell delightful (not nasty at all, at least IMHO)...and do look like pear trees! The blossoms look almost exactly like your images shown here. They are not wild cherry, those come later...and I don't know whether we have what they used to call "sarviceberry" around here. But I live in a nice rural area & we do occasionally see big clumps of these fragrant white shrubby trees (?) that bloom like clockwork each year just about April 30. A couple daze ago I even took some pix of the ones nearest my house, but they aren't uploaded from my diggy camera yet. If you can figure out what I'm talking about from what I've said, I would appreciate a bit of advice. We've been wondering for years exactly what these are... Thanks...! I think the trees you are asking about are black locusts. They look like pear trees, but smell a thousand times better. In the years that honey locusts blooms well, the scent can be almost intoxicating.